Anyone who has tried the new maya muscle system would have to agree that the Paint Muscle Weights tool is a big improvement on the old Paint Skin Weights tool. The colored weight display now makes a lot more sense. I think we owe Michael Comet a big thank-you. 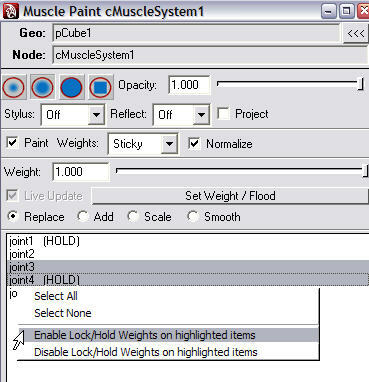 After playing with the Paint Muscle Weights tool, I noticed that I was stumbling each time I locked or unlocked weights. My modified version of cMusclePaint.mel addresses two issues. 1. The right-mouse-button menu for weight locking is too wordy and bordering on ambiguity. Here is a snapshot. I'm sure I could learn to live with it, but there is too much unneccessary text here. 2. My preferred weight painting workflow involves locking all joints except two. I smooth between those two joints and then move on down the chain to the next two. This would involve at least two goes with that rmb-menu to lock a joint and unlock another. So I changed a few lines in cMusclePaint.mel and now the interface looks like this. In my opinion the menu is easier to read at a glance. The new "Unlock Selected...Lock the rest" function saves me a few mouse clicks. 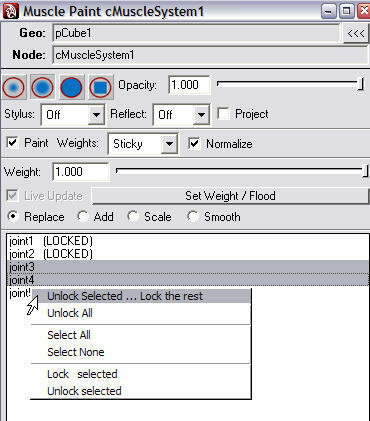 And the new "Unlock All" function does so while retaining the joint selection in the list.